Durham County Council is flying the flag for the armed forces this week. The Armed Forces Day flag has been raised at County Hall, in Durham, in preparation for Armed Forces Day on Saturday, 24 June and Reserves Day on Wednesday, 21 June. Representatives from the armed forces, along with Durham County Council employees who are members of the reserve forces, also attended a reception with Cllr Bill Kellett, Chairman of Durham County Council. 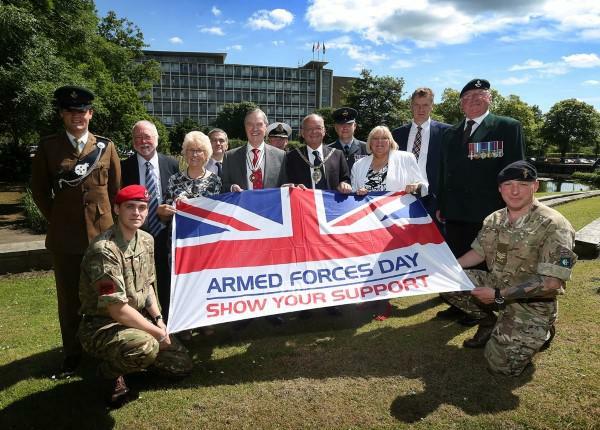 A range of activities will be taking place around the county over the coming days in the build up to Armed Forces Day. Cllr Lucy Hovvels MBE, Durham County Council’s Cabinet member for adult and health services and the authority’s Veterans Champion, said: “I am delighted that we are showing support for our armed forces community, serving personnel and their families, as well as recognising the essential role played by members of the reserve forces. Durham County Council is a signatory of the Armed Forces Community Covenant and has made a commitment to ensuring that members of the armed forces community – those who serve or have served in the armed forces and their families – are treated fairly and are not disadvantaged as a result of their service. In November 2015, the council received the Defence Employer Recognition Scheme Silver Award in acknowledgement of its work to support the armed forces community. The council also has a Reserves Forces Policy and offers up to 10 days of paid leave to enable employees who are reservists to attend their annual training camp.